In February 1978, when the flawless Gia Carangi arrived in New York at the age of barely eighteen, she had already landed a contract with one of the most prestigious modeling agencies in the world. The future that lay before her seemed dazzling. Blessed with a magnetic beauty and a unique personality, the young Philadelphia native reached the peak of success in only a few months, quickly joining the elite ranks of “supermodels.” One of the most requested models in her field, Gia appeared regularly in such magazines as Vogue, Harper’s Bazaar, and Cosmopolitan. For all intents and purposes, Gia’s life quickly became a fairy tale—or so it seemed. In only a few years, Gia’s destiny was complicated by unscrupulous individuals and by her inability to manage her cataclysmic success. Once on that road, the legendary model began a decline that led to her tragic end. Born This Way brings to light never-before-heard stories and unusual memories of Gia, offering new perspectives on her life, career, and personality. Through these previously unpublished accounts by those who knew and worked with Gia, Lanvin shines a spotlight on the woman herself, peering beneath the fast-lane glamor and the fame to capture the true essence of a supermodel who continues to mesmerize the world even decades after her death. Not a great read. The other book i read about her was better. That guy did 10 years of research on her. The co-workers all repeated each other in what they had to say about her. No offense, it got annoying. It started getting better when Elite chapter started. The movie isn't accurate either. The facts of her life were scattered out of order in that movie. What I loved about the movie is they focused on how nasty the addiction is. That, to me, was very important. So, she did end up helping others the way she wanted to. I remember first coming across Gia Carangi many, many years ago in what, if I can recall correctly, was an issue of Vogue. Ever since that day, I’ve always been a huge fan and never lost interest in her. I knew I had to give this a book a read as soon as I came across it, and now that I’ve just finished, I can definitely say I’m more than impressed and glad I had the opportunity to give it a read. “Born This Way” does a very admirable job of covering just about every aspect of Gia’s life, including both the good and the bad. Although I found some of the parts quite sad to read, I was glad that the author made sure to include them because it gives a very straightforward and honest look into her life as a result. I can’t recommend this book enough. 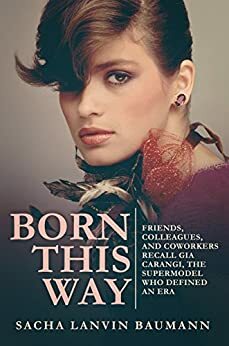 A further glimpse into the rise and fall of a fashion icon.New stories and insight into Gia Carangi's life as told by friends and colleagues..most of which I have never heard of before. I finished this book in one sitting and look forward to reading again.I hope there is more to come on the subject and from this author. 5.0 out of 5 starsGIA!! For anyone that is a fan of GIA, this is a book that you must have!! Lots of info from people who worked with her, & people that knew her personally. The author did an excellent job with the layout of the book. This is a great addition to my GIA collection. Thank you so much Sacha Lanvin for this gem!! For a book about a model there are shockingly few photos!